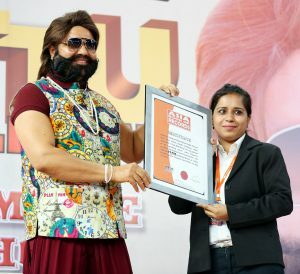 Saint Dr. Gurmeet Ram Rahim Singh Ji Insan from Dera Sacha Sauda, Haryana, India, organized a ‘Cow Milk Party’ on the premier of his upcoming movie ‘Jattu Engineer’ under the banner Hakikat Entertainment Pvt. Ltd, wherein most people(19,713) gathered, at Indira Ghandhi Indoor Complex, New Delhi, on May 17, 2017. Comments for BIGGEST COW MILK PARTY are now closed.